Eco-toilets are just the first step that individuals and communities can take to recover nutrients for sustainable local food production. In order for household composting to work on a wide scale, services need to develop to safely collect and process the residuals from eco-toilets. Because 80% of nitrogen in household wastewater comes from urine, keeping it out of the waste stream means that it no longer pollutes groundwater and other water resources. If that urine is recycled, it becomes a valuable resource to agriculture and ensures sustainability. 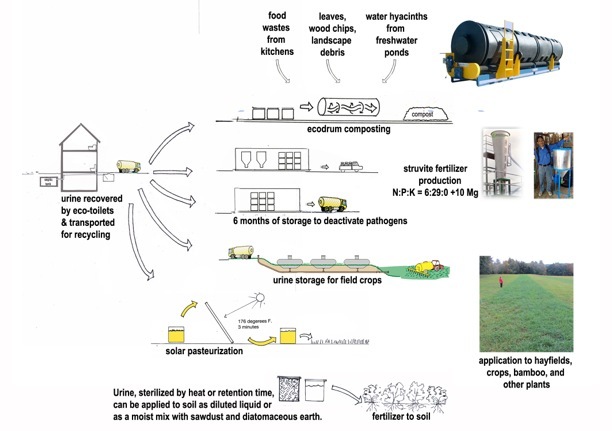 On a large scale, urine can be processed into a liquid fertilizer, or can be composted with other organic materials and made into a nutrient-rich soil amendment. Urine can also be processed into a dry, granular slow-release fertilizer called struvite. One way of doing controlled, large-scale composting is with Ecodrum, a contained, insulated, rotating drum composter. This technology was originally developed for farms, but could also be applied to safely recycle nutrients from human waste. 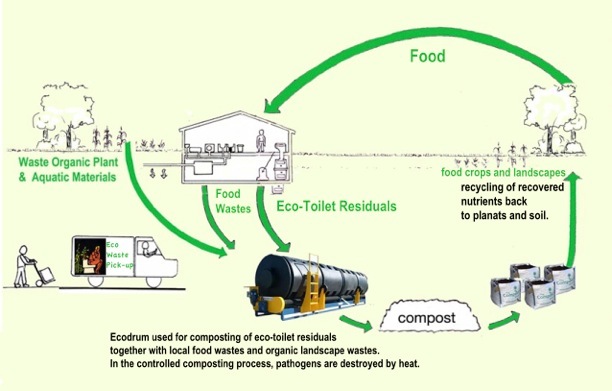 With the proper mixture of compost from eco-toilets and other organic materials, the compost passes slowly through the rotating drum, becoming hot enough to kill all pathogens, long enough to produce a Class A Biosolid. Thermometers in ports in the drum monitor the temperature to ensure proper treatment. Tests have shown that there are a range of combinations of temperature and time that will eliminate pathogens. 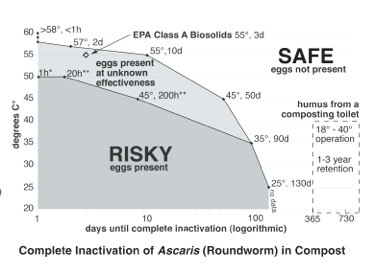 This chart shows the conditions that will inactivate one of the most persistent pathogens, Ascaris (Roundworm). Effective conditions include 55 degrees C (131 F) for 3 days, or a lower temperature for a longer time, such as 25 C (72 F) for 130 days. Additional studies are needed to determine the length of time at ambient temperatures required to reach Class A classification. In trials that included pharmaceuticals in the wastes, no traces of the drugs were found in the finished compost, suggesting that the Ecodrum could also be effective in eliminating some pharmaceuticals that now contaminate wastewater.